James Levine’s untimely resignation as music director of the Boston Symphony Orchestra (BSO) has been mourned by many. But as the season progresses, the BSO has proved again and again that it can bring out the hidden boon in what may have been a crippling incident for lesser groups. The vacancy in the conductor position has allowed the BSO to enlist the help of some of the best musicians in the world. On November 10, Korean conductor Myung-Whun Chung and pianist Garrick Ohlsson joined forces with the BSO in an impeccable performance of works by Carl Maria von Weber, Samuel Barber, and Pyotr Ilyich Tchaikovsky. The ensemble’s trademark explosive power with Maestro Chung’s restrained, almost minimalistic conducting was simply magical. Chung had the audience members on the edge of their seats from the very beginning. The program began with the Overture to Weber’s opera “Der Freischütz,” which is about a marksman who sells his soul to the devil in exchange for unfaltering aim. Its scoring in the first few bars is slow and dramatic enough, yet Chung slowed it down even more than is done in classic interpretations—by conductors like Carlos Kleiber and Wilhelm Furtwängler—to amazing effect: every orchestral nuance was magnified by the deliberate tempo. The BSO was with Chung all the way, responding immediately to his every measured gesture. Chung allowed the orchestra the rare opportunity to show off its dynamic mastery by paying special attention to the decrescendos rather than the crescendos. However, when the music called for fortissimos Chung and the BSO were right there as well, with Chung effortlessly abandoning his earlier restrained space of motion in favor of large, theatrical movements. Contrasted with the stillness of other parts, these phrases seemed all the more passionate and excited. They hit the mark with this piece—as they did with the remaining works of the night. Ohlsson, a BSO favorite—already having performed concertos by 12 different composers with the group—was more than up to the challenge of taking the stage after such a magnetic first piece. The rapport between the BSO and Ohlsson was particularly apt for Barber’s Piano Concerto. Unlike in traditional concertos, which feature a definite, almost antagonistic tension between soloist and orchestra, in this piece the pianist has a more symbiotic relationship with the orchestra. Motifs were passed between piano and orchestra fluidly, one mirroring the other. Though this kind of style puts a soloist in a precarious position, Ohlsson impressed nonetheless. He projected large chords with seemingly effortless strength. One moment his playing was percussive, but the next it was soaring and melodic. The winds and brass were in top shape throughout. The brass provided the rhythmic support before the cadenza in the first movement with unity and precision and cleared the sonic palette for Ohlsson. The trio of flute, oboe, and harp in the beginning of second movement featured just the right amount of vibrato from the winds. None of the erratic tuning that seems to plague the trombones and trumpets of the BSO during fortissimos on other occasions was to be found in that evening’s performance. This contributed in large part to the brilliance of the ensemble’s interpretation of Tchaikovsky’s oft-performed Symphony no. 6 in B minor “Pathétique.” Every wind soloist brought integrity to his solo line; the bassoon solo of the introduction was especially notable in this regard. As in the Weber, Chung took ample advantage of silence between phrases in this piece. Those who were in Symphony Hall that night will probably remember the final bars of the Symphony for a very long time. 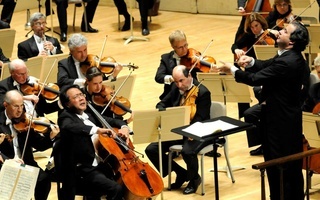 Following the descending theme by the cellos and basses and the final notes, Chung held his left hand over the orchestra—and at that moment he was presiding over not only the BSO but also the whole of Symphony Hall. All was obediently silent in anticipation for a good 30 seconds after the end of the piece. 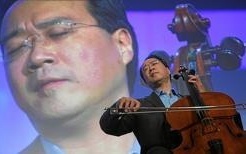 Only when Chung lowered his hands to his side did the audience explode into much-deserved applause.